By Vlue, May 17, 2012 in Completed Scripts/Plugins/etc. I can set my own title? Use the script calls, details of which can be found in the script. Hmm, is there a simple way to make it show more tiles? Graphics.resize_screen(width, height) up to a max of 640*480 will show 20*15 tiles. Can look odd though. Otherwise, far as I know, no simple way. Sorry but can you give me some screenshots ? I don't understand what exactly is this for ? @ Vlue - I have so wanted this feature for so long as well! I didn't care if it was pixellated like oldschool graphics! Haha - Nice work with this one! Have you found any dimensions that scale to the graphics perfectly? I've been trying a few and the text and some sprites don't scale well and look a little strange. 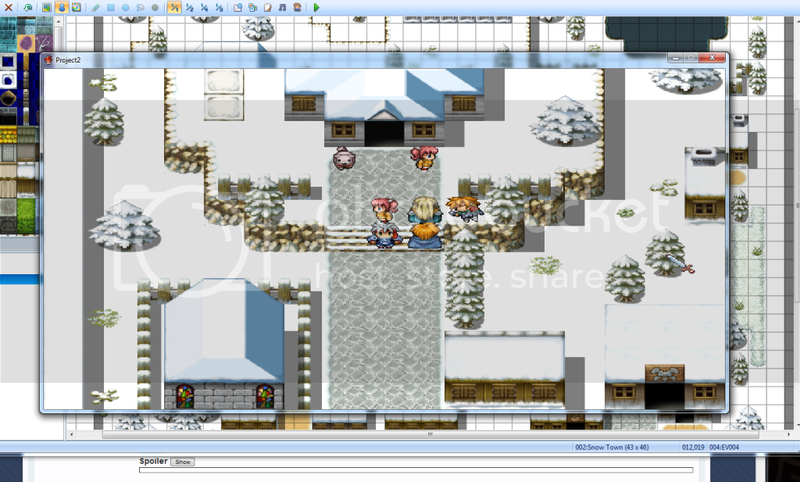 @ Lanechology - it keeps the resolution the same but increases the window size (and zooming in on the sprites). Proportional multiples of 32. Default res is 544x416, so scale them by the same amount. 640x480 is not the same scale as 544x416, 640x489 is however. 544x416 is the lovely aspect ratio of 17:13 (which makes little sense save to fit that many tiles upon the screen when it could easily have been kept at 4:3 with our 20*15 tile maps) which provides us with some pretty funny values, unless you wanted to bypass that and Graphics.resize that thing to 640*480 (more of a hassle then it should be). Ideally it would be, but alas. You have to rely on the limits within what they have. You can use Graphics.resize to change to 640x480 and get that 4:3 effect, then you can keep to that. But that presents it's own problems with windows and characters not lining up and maps smaller then 20x15 yelling at you... and probably more I don't know about. I'm using graphics.resize to get 640x480 and have set everything up to work with that (no maps too small etc.). In that case I'd say 1280x960 or 1920x1440 (Second one is a bit big...) Whole number multiples ftw! Do you know why the graphics stretches to the screen? Hmm, nope. Not really. I took the chance that calling the API to resize the window would scale it to fit and it did. lol, if you figure out how to make it not stretch, I can probably use that to draw more tiles. Updated to include functions to toggle true fullscreen/windowed mode and to resize window to completely fill the monitor window. The resize to fill the window doesn't work on full screen, even if you had resized before toggling in full screen . is it possible to get this so that when it fills the monitor is only goes as far down as the taskbar and to work for title screen? I'll look into the sans taskbar portion, as for before the title screen you can just put Window_resize.r(640,480) or whatever you want in a line just below the script and it will run right when you load the game. Actually there's no black bars if you use Yanfly engine and put it to 640x480 first and then run the script. I am just saying as full screen, it'll go 640x480 even though it was 1980x1080 as window. Thank you! This really helps Ace look more pro. If you ever need some sprite work done you let me know. Hmm, I love this script but this may be a stupid question but is it possible to make this start as soon as you hit playtest? so it works during the title screen even right away? Go to the script entry and put the script call in a line anywhere below the script. It'll run right away.